The Michaelerkirche Church doesn′t look overly exciting from the outside, but once you enter the building, the ancient nature of the church is revealed. It was probably built around 1220 and in the 13th century, the Michaelerkirche was one of only three parish churches in Vienna - the other two being the church of the Schottenstift and the Stephansdom Cathedral. As one of the oldest churches of the city, the Michaelerkirche preserved a Romanesque core, which was supplemented with a bizarre array of Gothic, Baroque and neo-Everything that echoes pretty much every period in Austrian history predating the 20th century. Indoors, the church has information sheets that point out different elements of interest. The crowds come for the corpses, though: The Michaelerkirche is famous for its cellars and catacombs, where dead bodies did not rot properly, but were mummified due to warm air circulating the rooms. Several coffins are on display, some of them open with the corpses in their clothing still inside, now revealed to the touristy observer. Recently air-conditioning had to be implemented, as beetles had infested the bodies and high humidity harmed them. A total of 4,000 wealthy but dead Viennese were buried here between the 14th century and 1784. A tomb in the catacombs was very expensive and financed the parish - yet at times, there were four servants employed for the maintenance of the tombs. Speaking of morbid sightseeing: The Michaelerkirche was the place where Mozart′s Requiem was first performed, despite of being unfinished. Mozart′s friend Emmanuel Schikaneder, head of the Theater an der Wien and libretto writer for the "Zauberflöte" paid an exorbitant 26 Gulden for the service - a coffin cost 3 to 17 Gulden back in the days. During the 30-Years′-War, the church was transferred to the Barnabite monks from Italy. They looked after it and developed the building until they left Vienna in 1920. Since then, the care is done by Salvatorian monks. Walking out of the Michaelerkirche, you end up at the Michaelerplatz Square. From here you can face the Michaelertrakt Wing of the Hofburg, originally designed by Fischer von Erlach in the 1720ies, but finally built with alterations in the spirit of the crumbling Empire (bigger, grander, more) towards the end of the 19th century. The flanks of the pompous gates are decorated with two gigantic fountains that allegorically illustrate Austria′s "Macht zur See" (Power at Sea, ie. navy, now gone) and "Macht zu Lande" (Power at Land, ie. military, never really existed). In the middle of the square, you can marvel at an archaeological excavation site preserved by the Wien Museum. It shows the foundations of the Roman army camp Vindobona, the 18th century Burgtheater and a 19th century residential house. The strange marble frame for it was designed by Hans Hollein, a famous contemporary architect from Austria. Speaking of architects: Looking to the right hand side of you (assuming that you have just come out of the Michaelerkirche), you can see a plain building with green marble panelling, now a bank. This is the Loos Haus, designed by the architectural legend Adolf Loos and built in 1910/1911 for a local entrepreneur. 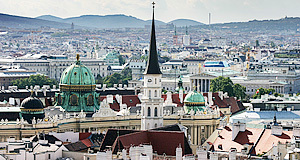 Emperor Franz Joseph I and the Viennese hated the "house with no eye-brows" so much, that there were attempts to demolish it right after its opening. As sort of a compromise, Loos allowed to add flower boxes made of bronze as a decoration. These days, most people would just walk by the building without even noting anything revolutionary about its design. Yet in 1911, Franz Joseph was said not to use the Michaelertor Gate anymore when entering the Hofburg due to the ugly sight. This is particularly drastic as the Emperor was very reluctant to criticise architects since the one in charge with the Staatsoper had committed suicide after receiving vicious criticism from Viennese and Emperor. The owner of the Loos house didn′t give a damn about the Viennese and hired Adolf Loos right away do design his private house, too. Another attraction at Michaelerplatz Square is the - apart from the ugly Hercules statues that we shall ignore here - the Café Central, one of Vienna′s most traditional cafes. Peter Altenberg spent a fair share of his life in here - apparently this is where he said that the people who go to Cafes are those who look for loneliness with company. Other nearby attractions include all the Hofburg sights (Spanish Riding School, National Library and Prunksaal, Augustinerkirche, Albertina, Neue Burg, Burg Museums and Kaiserappartments), the Staatsoper, the Minoritenkirche, the Graben street, the Peterskirche and the Stephansdom.